If you are searching for “buy here pay here Phoenix“, In Power Motors 4 can help! We are the best buy here pay here car dealership in the Phoenix Valley. What Is (BHPH) Buy Here Pay Here & In-House Financing? BHPH or Buy here pay here is a phrase used by 500 down car dealerships that offer in-house financing. With in-house financing or buy here pay here you can finance a car and make the loan payments at the same exact car dealership. A used car salesmen would say “buy the car here, pay for the car here“. Can You Get In-House Financing With Bad Credit? BHPH dealerships normally work with buyers that have bad credit or no credit. As long as you can prove you make enough income and have a drivers license, most BHPH dealerships will offer you in-house financing to purchase a used vehicle. Apply for in-house financing online. If you do not make enough income for the BHPH dealership to trust you, they will make you get a cosigner with good credit or better income to help with financing the vehicle. Can a Buy Here Pay Here Car Be Traded In? Yes you can trade in a BHPH car even it you have not completely paid it off yet. Normally, the BHPH dealership that sells you your used car will pay off your previous loan and add the balance onto your new loan. Dealerships usually take care of all the leg work in these types of situations. For example, if you owe $4,000 on your old vehicle that’s worth $3,000, the dealership just add the $1,000 to the new loan. 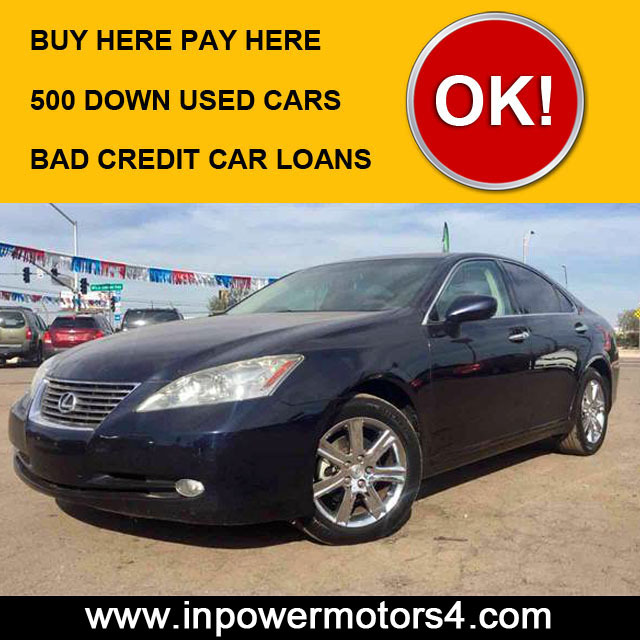 Looking for buy here pay here car lots in Phoenix, stop by In-Power Motors 4 today. Stop by our buy here pay here car lot at 1009 E. Hatcher Rd. Phoenix, AZ 85020 today, give us a call at (602) 368-7171, or search online to find $500 down used cars, trucks, and SUVs to fit your budget. Buy Here Pay Here Near W. Buckeye Rd. Buy Here Pay Here Near Indian School Rd. If you are searching for "buy here pay here Phoenix", In Power Motors 4 can help! We are the best buy here pay here car dealership in the Phoenix Valley.